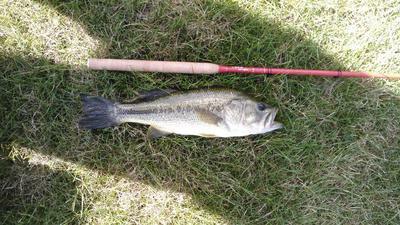 While working the bank of a small pond for bluegill with a slow sinking dragon fly, the line had a hard stop. At first I thought I was on a rock or stick - then the line moved. I did a small hook set and then he knew he was hooked. What seemed like fifteen minutes was only two, but with runs, jumps, and a tail walk that went for at least six feet. I worked that rod to the left and right. Looking up at the rod it seemed the tip was as low as the handle. Only having this rod for two weeks I didn't know to be impressed or scared so I worked on getting his head up out of that water. Once that was accomplished he lost the fight. The fly was set on the top of his tongue and fell off as > tried to get to it. I am not sure if the rod would handle a much bigger fish but it did this one. I was impressed.